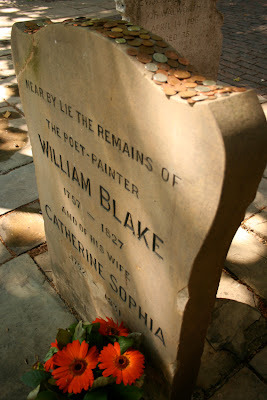 I spent my last afternoon with Bibi for a while near the tomb of William Blake and Daniel Defoe at Bunhill Fields, near Old Street. The sun's rays raced through the plane trees, creating an animated, dappled play of light. Two runtish dogs raced each other across the green. All was well with the world, at least here, where the ancestors lay sleeping. The last person to be buried in this cemetery for non-conformists was laid to rest here one hundred and fifty years ago. It is a beautiful, tranquil place. I imagined that William B was wandering about still. How moving that all these years after his death, flowers are still placed by the tombstone. What's with the coins on the gravestone? God. I really should go...It pains me when I remember that I have not paid homage to these great men, people for whom I came to this country in the first place. coin for the grave - for easy passage of the dead. Perhaps?